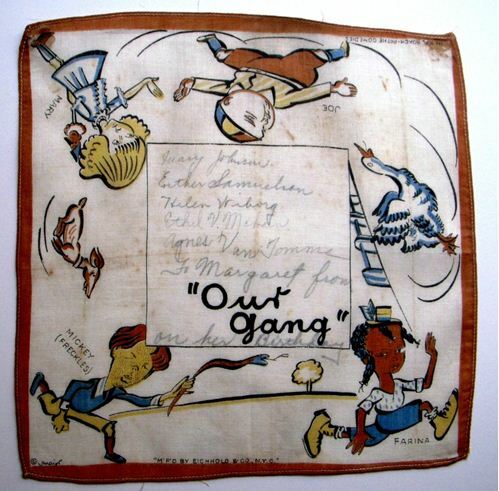 I love this hankie featuring Farina, Mary, Joe and Mickey (Freckles), all characters from the original Our Gang Comedies. Perhaps it should have been included in the Hollywood blogs, as heaven knows, it’s a classic, dating all the way back to a time before movies were “talkies.” It seemed to me, however, to fit another category or two even better – Wabi Sabi and Friendship, so I’m giving it ‘face time’ separate and apart from the hoopla of Hollywood for you to savor and enjoy. Some might pass by this small tattered and worn square of cotton, considering it spoiled or used because of the handwriting contained therein. True, the writing may decrease the value for a true collector, but not for me. Five friends presented this to Margaret on her birthday. 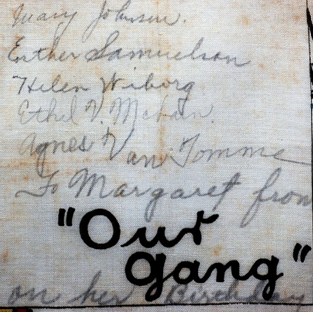 Note that the signatures of Mary, Esther, Helen, Ethel, and Agnes are adult handwriting. Whether these women had been friends since childhood or forged the bonds of friendship as adults, we’ll never know, but owing to the choice of handkerchief, I suspect the former. What we do know is that they’re definitely a close knit group, and probably have a great sense of humor in order to sign and present this beloved child’s hanky to their dear friend. 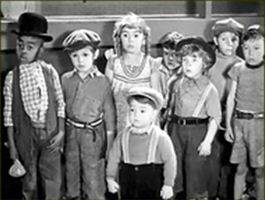 Our Gang, also known as The Little Rascals was a series of comedy films the featured a group of neighborhood children. 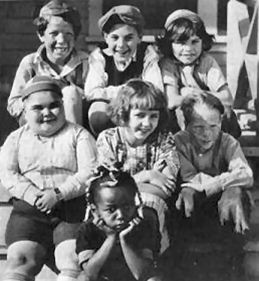 Groundbreaking for its day (1922) and for decades thereafter, the show’s creator, Hal Roach, featured boys and girls, black and white, large and small, plump and skinny, together as equals. Film historian Leonard Maltin asserts this “broke new ground” in cinema. The characters look, talk and act like regular children, getting into all sorts of childish mischief, as opposed to sounding like small adults spouting stilted dialogue. There were 220 films in all, and the first 88, produced at Pathé Studios, were actually silent. Only when Roach changed distribution to MGM in 1927 was the series converted to sound. (so we know this handkerchief is at least 87 years old.) The appropriately titled Small Talk was the first talking Our Gang film, released in 1929. The films have changed hands many times over the years and remarkably, are so beloved and popular, they still remain in syndication. “Are we going to be friends forever?” asked Piglet.